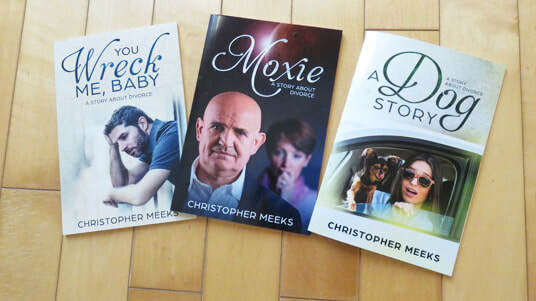 Would you like to get Christopher Meeks's next books before anyone else--and at no cost to you? This includes future books, too. Free to your email! He is about to come out with a series of Amazon Short Reads, which is a new classification of Kindle eBooks on Amazon: short "books" that take only 15 to 60 minutes to read, measured in 15-minute increments. Meeks's new series will be literary short stories that jump into the lives of people in or out of love--often with humor. There will be one to three short stories per book. So far he has six books, and sometime in August, he'll start sending the first three to reviewers. He needs reviews on Amazon. If you like what you read, you would review each book separately. You don't have to write a lot. If you would like to be one of these reviewers, fill out the form below. He will then send you the first three books: "Moxie," "A Dog Story," and "You Wreck Me, Baby." ​ In the form below click the checkbox for which form you want the books. If you choose the last option, print books, then be sure to add your physical mailing address.